In A Pikle has a large variety of additional items to sell to your customers and yet how often are you content just to sell an empty cover or one complete Pikle? Recognizing that unless you suggest and offer additional items to your customer, they most likely won’t purchase anything else. As a salesperson your job is to share ALL of our products with your customers. Offer the following suggestions to see your sales and commissions increase! Many of our items are consumable. Are you suggesting your customer’s purchase refills now so they will always have plenty on hand. Utilize promotions or customer specials. If we offer a FREE cover as a monthly special are you encouraging your customer to purchase the “Complete Refill Pak” so they have an additional complete Pikle. Point out that the In A Pikle bag is the perfect gift. Mention how convenient it is for baby and bridal showers, birthdays, holidays, graduation gifts, etc. Share the many ways the empty Pikle covers can be used. Prepare a 3-ring binder with images and ideas for your customers to view. 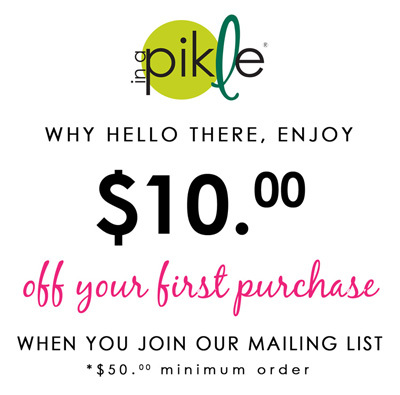 In A Pikle bags are perfect for your purse, car, diaper bag, boat, R.V. and many other places. When you share ideas with your customers they will recognize the many additional uses for the In A Pikle bag. This is turn means more sales and more commissions for you! Don’t forget Field Training Call this month, October 27th @ 7:00pm (MST)! The number is be posted in the “Pikle Professional” Facebook Group and in the Pikle Press, or feel free to call iRep for this number.